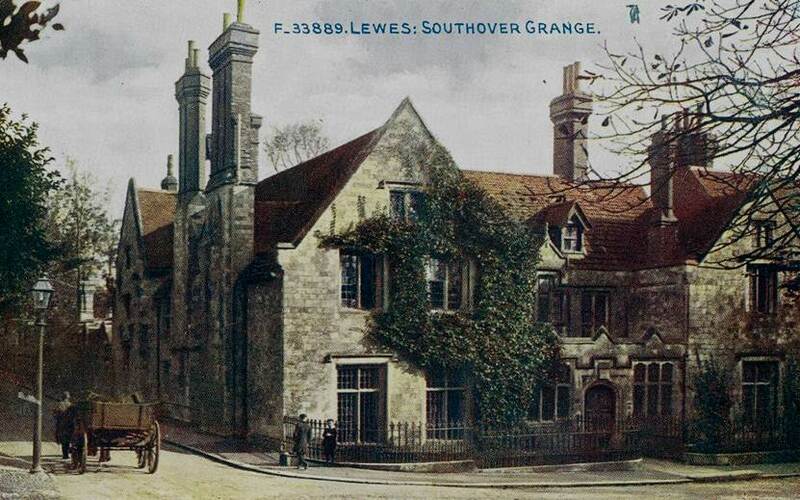 Southover Grange, one of the best known Lewes buildings, has featured in the local news recently. Lewes District Council is engaged in ‘Operation Nexus’ to rationalise its property portfolio, focusing services on Southover House in Lewes and a second centre in one of the coastal towns. The project brief proposes that buildings surplus to requirements will be disposed of. News that East Sussex County Council had not renewed its lease of its premises in Southover Grange, so that the local registry office would move to an office block behind Tesco and weddings to the Town Hall, pointed to an uncertain future. My short talk will cover the history of this house. Three centuries as the private home of the Newton family was followed by 75 years in a succession of hands, not all of them careful, prior to its purchase by Lewes Borough Council for the benefit of the town at the end of World War II. The Borough’s initial plans for it may surprise you. We shall be serving mince pies and mulled wine in the interval, rather than coffee and biscuits prior to the meeting, and will then hold our inaugural A.G.M. (see below). As usual all will be welcome. This Photocrom Company postcard of the Grange carries a 1910 postmark. There will be three formal items for the inaugural AGM. Approve the initial Terms of Reference as printed below. These will be reviewed during the inaugural year. Appoint officers for 2013. Volunteers to date include Ian McClelland (chair), Ron Gordon (treasurer), Barbara Merchant (web editor), Ann Holmes, John Kay, Jane Lee, Marion Smith. Approve the membership subscription(s) and meeting entry fee. If you are interested in offering yourself for one of the officer positions you may do so at the meeting, or in advance by email to John Kay or Ian McClelland. We look forward to your continued support and your participation in the AGM. Title: The name of the group shall be the Lewes History Group (LHG). To develop and document knowledge of the history of Lewes, the place and the community. The scope also includes the local communities that have directly influenced Lewes and vice versa. To disseminate knowledge about the history of Lewes to anyone with an interest and in particular to improve the knowledge local people have of the history of Lewes. To make the history of Lewes accessible to the general public through an annual programme of public meetings and events. To promote projects that engage a broad range of local people and are aimed at the development, documentation and dissemination of knowledge about the history of Lewes. To become a widely recognised and respected group as a source of knowledge and as active participants in the development of knowledge. LHG Membership will be subject to the payment of a membership fee. Membership is open to all and will not discriminate against anyone on the grounds of age, race, gender, sexual orientation, disability, religion or belief. Membership details will be held electronically and will not be distributed to third parties. To elect LHG Executive Committee (LHGEC) officers. Executive Committee officers are elected each year at the LHG AGM for an annual term effective from the date of the AGM. Each candidate should be proposed and seconded by existing LHG members. The LHGEC must be notified in writing of nominations no later than the deadline for receipt as specified in the AGM meeting notice. The LHG financial year will be from 1st September to 31st August. The AGM will be held before the end of each calendar year. The quorum for the AGM will be 20 members. The LHG Executive Committee is elected from the LHG Membership. The LHGEC is responsible for managing all key activities of the LHG. 3-5 open positions, who will cover other tasks on an as-required basis. The group’s brief will include arranging the programme, managing the website, public relations and coordinating grant applications. The quorum for LHGEC meetings will be 4 officers. LHG members will normally not receive remuneration from the LHG for any services rendered on behalf of the LHG such as the work of the LHGEC and speaking at meetings. Expenses incurred on behalf of the LHG will be paid subject to the approval of the LHG Treasurer or nominated LHGEC deputy. LHG members may receive remuneration and expenses if a member is formally contracted to work on behalf of the LHG providing funds are available from a source other than from LHG members’ subscriptions and event entry fees. Any decision to change the Terms of Reference must be approved at an AGM, or at a general meeting of the members specifically called for the purpose, by a majority of the members present. Any decision to dissolve the LHG must be approved at an AGM, or at a general meeting of the members specifically called for the purpose, by a majority of the members present. The meeting that approves dissolution will also approve the dispersal of all assets to one or more organisations with similar aims to the LHG. 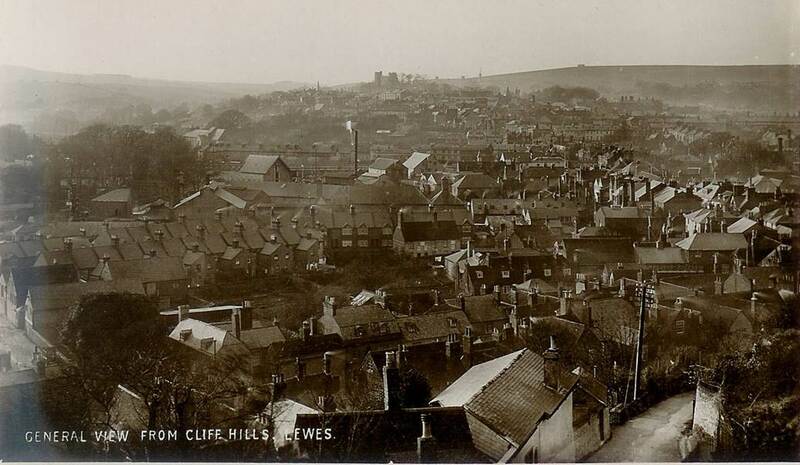 At first glance this photograph dating from around 1900 appears to be nothing more than a view of Lewes rooftops. But spend a little time looking further and you will find plenty to keep your interest. Taken from just above Chapel Hill, the road on the near left is Timberyard Lane, with the double roof-line of Morris Road going diagonally towards the centre of the image. The taller house in South Street (No. 22/24) is still there, but the one to the right has gone – it is now the access road to South Cliffe housing development. A little further along, (just above the telegraph pole), is a long low building with lots of windows, which I think is the rear of approximately No. 33 Cliffe High St. Following the line of Cliffe High Street you can see the railway bridge crossing what is now Cliffe precinct, next to the white building. The long roofline on the far right of the image is the Naval Prison on North Street. Further up towards the skyline are the twin oast houses of The Maltings, and on the horizon Shelleys windmill, just behind the Prison chimneys. Dropping down again in front of the castle is the County Court building, and a little lower the words “Sussex Express” are clearly visible on the roof in Walwers Lane. Swinging across to the downs on the left, you can just make out Ashcombe windmill. Hidden in the trees in the middle ground is Leighside House which used to stand on what is now the Railway Land, and this is surrounded by the railway lines and goods yard. I hope to produce a book on famous Lewes residents, provisionally titled ‘Eminent Lewesians’. The qualification for inclusion is to have lived in the town, or to have had considerable influence there, and also to have been known in the wider world. It will be published by The Friends of Lewes. Some of these people may be completely forgotten now, but in their time their fame spread beyond Lewes. I am especially interested in 19th & 20th century names, but best not to include people who are still living. I want baddies, as well as the great and good. Do you know of any famous murderers or fraudsters? I will be happy to share my present list of candidates to anyone who contacts me directly with a view to making suggestions. Email Kim Clark using this form. 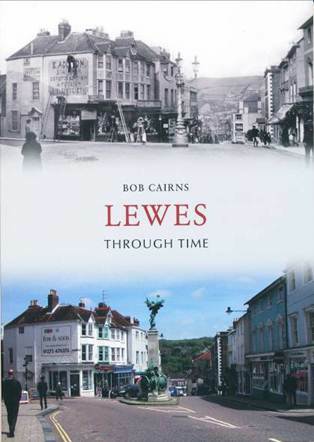 Bob Cairns’ new book, ‘Lewes through Time’ published by Amberley Publishing, compares stunning modern photographs of Lewes with old images taken by the town’s Victorian and Edwardian photographers, demonstrating in some cases how much has changed, and in others how little. There are almost 200 photographs in the book, including many I am pretty confident you will not have seen before. Bob will be speaking at our January meeting, but if you need a copy of his book this side of Christmas it is available at £14.99 from Laporte’s, Wickle, Bag of Books, the Lewes Information Centre and the Barbican House Museum bookshop. 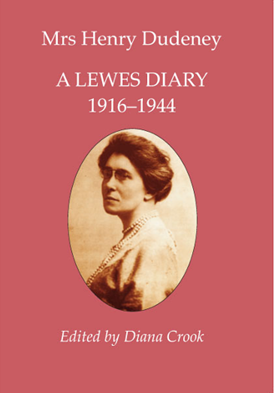 Originally published in 1998, ‘A Lewes Diary’ has become popular both in Lewes and further afield, as it has a universal rather than just a local appeal. A once famous novelist, Mrs Dudeney’s acid comments led to her diaries being kept closed for nearly 40 years. She vividly describes her tragi-comic marriage to the celebrated mathematician Henry Dudeney, her career, her lover and two world wars, as well as her forays into High Society through her friendship with the millionaire politician Sir Philip Sassoon. The passage of time has allowed a new edition to give previously withheld information on Mrs Dudeney’s lover, a Sussex artist, as well as intriguing gossip concerning a clergyman and an amateur actress. Copies are available from the Barbican House Museum Bookshop, Lewes, at £9.99, or directly from the author, Diana Crook, at 100 Marine Parade, Seaford, BN25 2QR, at £9.99 plus £1.50 p&p. The second of the two postcards that were described as ‘bonfire’ postcards in Bulletin no.28 has no connection with bonfire celebrations whatsoever. 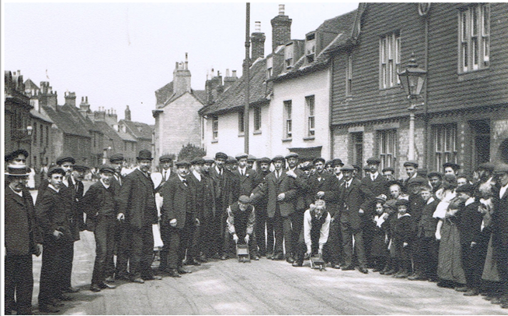 The photograph was taken by Harry Bartlett at Library Corner (bottom of School Hill) on Whit Monday in 1910 and shows the start of the annual Wheelbarrow Race between the ‘champions’ of each of 2 pubs situated opposite one another in South Street – The Thatched House and The Fountain I think. The race had just one rule – that the wheel of the toy wheelbarrow must remain in contact with the road throughout – and the first one back to The Thatched House was declared the winner. 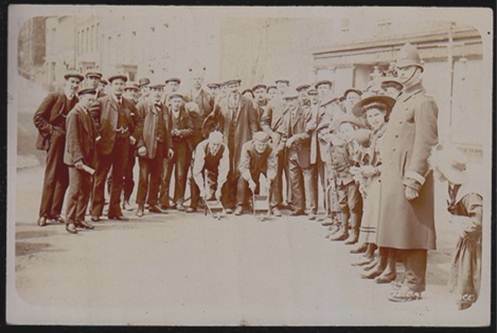 Below is a copy of another photograph that Bartlett took in South Street on the same day, but at the finish of the race. The annual race ceased following the outbreak of World War 1 in 1914. NB: you have probably discovered that all Bulletin pictures can be copied and expanded to see additional detail. You can also click on the web versions to expand them. This entry was posted in Biographical Literature, Cultural History, Lewes, Local History, Social History, Urban Studies. Bookmark the permalink.